Princess Blue must have had a roaring good time! Queen Bey and Jay Z&apos;s only child Blue Ivy got the royal treatment when she turned 2 years old on Jan. 7. Her famous parents rented out Jungle Island, a wildlife park and botanical garden in Miami, Fla. See more pics of Blue Ivy, here. During the fun and rainy outing, the birthday girl donned a green ensemble and sneakers. She also borrowed Beyonce&apos;s "Flawless" gold necklace (a nod to the feminist anthem of the same name on her titular fifth album) that the megastar, 32, posed with via Instagram on Dec. 30. The 44-year-old rapper went casual in an oversized sweatshirt, while the "XO" songstress dressed down in a "Surfboard" sweatshirt while swiping her chestnut locks back in a knit cap. Surfboard is a reference to Beyonce&apos;s raunchy-romanctic "Drunk In Love" song, which features a rap from Jay Z himself. Click here for more pictures from their magical day out. After the adventure, the trio headed to Joey&apos;s Italian Cafe for a bite to eat. The family sat at a large round table and ordered pizza. 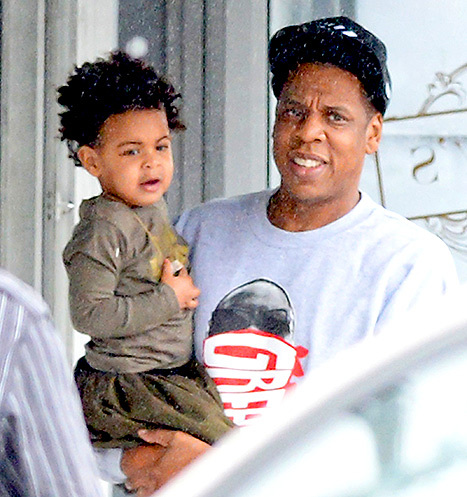 At one point, Jay Z even gave Blue a cell phone when she began to fuss, asking her to "say thank you" first. And she did! "It was really cute," an eyewitness tells Us Weekly. "They&apos;re such fun and attentive parents and pretty normal people considering how famous they are. There weren&apos;t many people around and maybe one photographer outside but the restaurant closed the shade so the photographer couldn&apos;t see in. It allowed them to have a pretty normal lunch."